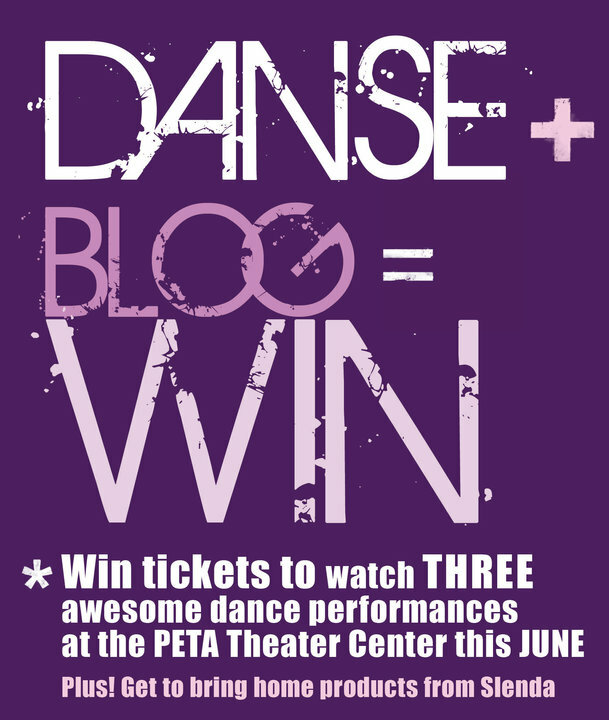 To all Pinoy bloggers – get this limited chance to win FREE tickets to PETA’s East West Danse (watch and experience Bellydancing and Middle Eastern dance fever, Pinoy and French contemporary dance and Agnes Locsin’s masterwork: Sayaw, Sabel – a dance performance inspired by BenCab’s painting, Sabel). You also get a rare and exclusive backstage pass to PETA’s dance event. Plus! Get to bring home SLENDA products. Joining is easy. -Interested bloggers need to send their names, contact numbers and a link of their sample blog to petatheater@gmail.com. -Deadline for entries is on May 31, 2010. 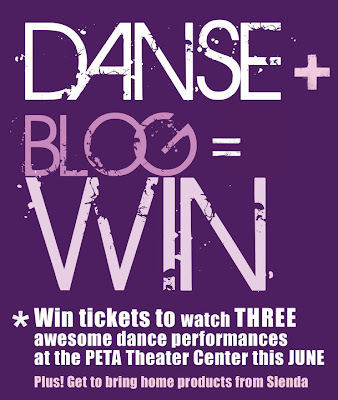 -Upon submission, a link of their blogs will be featured at the PETA and SLENDA Facebook account and will each receive the following prizes: One (1) 43rd Theater Season Pass from PETA (a limited pass which allows them to watch all of PETA’s plays for PETA’s 43rd Theater Season) and; One (1) trial box of SLENDA diet pills. What are you waiting for, DANSE BLOG AND WIN! The first week will be a celebration of the body and womanhood through the beauty of Middle Eastern dance. Bellyfest 2010 will be a day filled with colorful dancing, dance workshops and performances and endless shopping at the Arabian themed market. After an afternoon of workshops and dance, the Grand evening show will feature the finest bellydancers in the country today: Jill Ngo, Arcel Bengson, Nilda Boquiren, Lovely Rodriguez with the special participation of international bellydancer, Belynda Azhaar. The following week will be a fusion of Filipino and French contemporary dance. Contemporary movement pieces from two young Filipino artists, Rhosam Prudenciado Jr. and Donna Miranda will be featured alongside performances by the Eolipile Company, a French company known for merging contemporary dance, martial arts techniques, acrobatics and multi-media exploration. Agnes Locsin, foremost Filipino neo-ethnic choreographer presents her newest dance creation: Sayaw, Sabel. Known for her unconventional work, Agnes Locsin presents a performance that is inspired by National Artist Ben Cabrera’s painting, Sabel. This will be a collection of dances depicting how Filipinos go through life in the midst of all their troubles and tribulations with shining resilience. Performing the piece are some of the most established names in the dance industry: Christine Crame, Annette Cruz-Mariano, Judell De Guzman-Sicam, Gaye Galiluyo, Sony Locsin, Alden Lugnasin, Ernest Mandap, Ryan Ocampo, Camille Ordinario-Joson, Georgette Sanchez and Perry Sevidal. The title role will be portrayed by Maribel Legarda and Melvin Lee. 正玲正玲: Thanks for dropping by. But please no links on anything obscene. Hope you understand.